At Villa Las Rocas you can enjoy the privacy of a splendid villa with pool, large garden and breathtaking ocean views combined with easy access to long uncrowded sandy beaches and the unspoilt beauty of Andalucia. This is secret Spain at its best. Not only are you at the seaside, you are also right alongside a nature reserve with glorious walks in the hills and Phoenician graves. At the end of the day its time to relax with sundowners soak up a spectacular sunset as the sun goes down over the sea. The chill-out zone on the pool patio is the place to be with the BBQ tempting your evening meal. The villa is large and sprawls over three floors. It is ideal for large family groups, for you and your friends and is attractively furnished with all home comforts, including a modern fully equipped kitchen, dining areas, two lounges (one with a log fire), satellite TV with bank of the latest movies and if that is not enough there are DVDs/Videos/CD/games and fast WIFi broadband. Outside, the pool terrace and gardens provide plenty of sun and shade and table tennis to keep you on your toes. All bedrooms enjoy great views - the upstairs bedrooms share a large sun terrace, the downstairs bedroom opens onto the gated pool terrace and the remaining 2 bedrooms are linked with a shared bathroom and open onto a garden terrace close to the pool. The villa ensures lots of space and privacy for all. In the summer when the villages are bustling and all the restaurants are tempting your taste buds with their local cuisine, retreating to the privacy of the villa is pure bliss. If you prefer low season visits when there is no-one around you have the beaches all to yourself and the quietness is heavenly. There are fewer restaurants open locally and our favourites in the next villages, of Barbate and Vejer are open all year round.... as is the golf course just 25 minutes to Montenmedio. Closest airports are Gibraltar and Jerez, then Seville and then Malaga. The Villa is my haven away from it all and often a time when the whole family get together under one roof as its large enough for all of us.. When I'm not lying at the pool or walking on the beach or being creative in the kitchen, I hang out with the wonderful friends I have made in Zahara or walk along the beaches. I love the friendly local culture and I get to practise my Spanish too. I also love making Las Rocas a wonderful place to be for my guests. I never thought I could share this special place but I have had so much pleasure over the years from the wonderful feedback and knowing that the people who stay love the privacy, luxury, space and comfort it provides. I do my best to make it an easy, beautiful and enjoyable place to be. Curro and Victoria are the stars who take care of the guests and they do it with love and respect. They are shining examples of nothing is too much trouble. So I count myself very lucky to have and to share this magnificent space with all who come here and to have the support of the team who work with me to do that. Whilst you are staying at the villa I may be in my home town of Cape Town, or in Surrey in the UK where I now live or travelling just like you. We came on holiday in an area unfamiliar to us and heard that it was an unspoilt part of the Spanish coast. We thought we might purchase a holiday apartment whilst we were there and left 10 days later with an absolute jewel. It was this most incredible 360deg view that clinched it. The house at the time needed a lot of work so it was a great opportunity create a magnificent holiday home .... a far cry from a little holiday apartment ! We simply fell in love with it. We realised that :as Rocas could accommodate our large extended families or we could have a large group of friends or run a workshop making all of the dreams we had possible. I love it because it spreads over 3 floors providing privacy and 'space' for all. The gardens are tranquil too and there are so many areas to hide, chill, read a book or play. I feel like Queen in her castle high above the world with the miracle of also being able to listen to the birdsong in the quiet of the day or the waves on the beach as I drift off to sleep at night. Im so glad that this property is not right on the beach because at times the energy from the sea can be overwhelming, the people on the beach invasive and we would never have the luxury of the breathtaking views we have. Its heavenly. toilet, combination tub/shower, Very large bath. The cupboard is stocked with fundamentals at the beginning of the season. We ask that guests top up what they use. Oil, spices, flour, sugar. We had a wonderful stay at Las Rocas. The house was very clean, the facilities are great and it is well planned. It works very well with 3 different families as there is enough space for everyone without feeling on top of each other. The kitchen is well equipped. Linen and towels are good quality etc. We were very comfortable and felt very welcome by Curro. Thank you so much and we look forward to coming to stay again. Amazing property and extraordinary views! "We had a wonderful holiday. What an amazing location! We really enjoyed the area and the accommodations were perfect -- the view!! Our NYE dinner was great and was coordinated very well. Curro was lovely to work with and we hope to come back for a visit in the future. You are so lucky to have such a fabulous home." If you are considering this location for your next vacation book it NOW! You will not be disappointed. Such a fabulous home and the view!!! We had a wonderful holiday. What an amazing location! We really enjoyed the area and the accommodations were perfect -- the view!! Great place with breathtaking views of the strait. Very nice house with impressive views, on clear days you can see the coast of Africa. The pool feels great after a day at the beach. The closest beach Los Alemanes and specially Bolonia are highly recommended. Los Alemanes beach can be seen from the house. The house caretaker, Curro, was great and made sure we felt right at home. The only issue was the road up to the house, it is poorly paved and very curvy, access to the house parking thru the front gate is pretty tight if you have a big vehicle. Great places to eat nearby, you must try the Sarda at the Mirador in Barbate. Thank you Gale for sharing such a great place with us. Great Villa in a great location. Very nice villa with impressive views of the Gibraltar Strait, on clear days you can see the coast of Africa. Well furnished accommodations. Pool is a big plus after a long day at the beach. Great vews of the close by beach Los Alemanes, crystal clear water and beautiful setting. The property owner, Gale, was most helpful setting up online payment thru VRBO for us. Curro, the housekeeper was fantastic, very helpful and resourceful. Overall we had a great experience renting this Villa. The only complaint is the road up to the house, and the entrance thru the gates, if you have a large vehicle you might have issues getting in and out but it won't be a problem for most full size sedans. 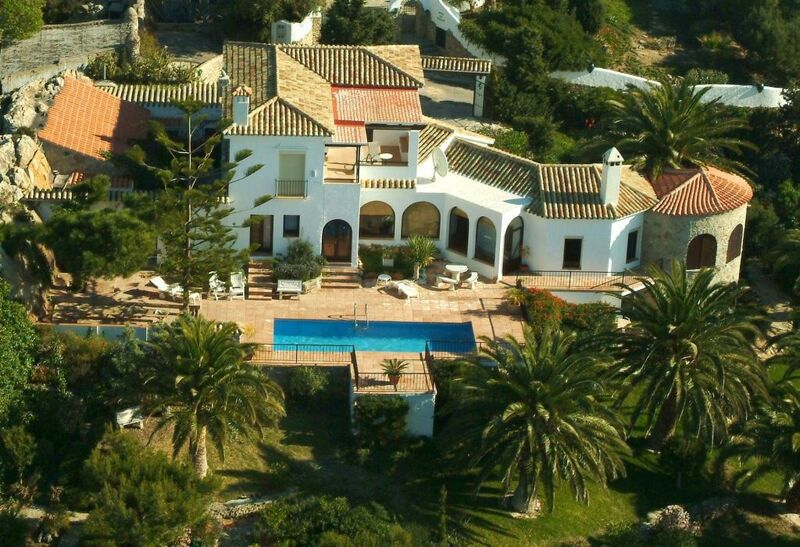 I would definitely recommend this Villa to my friends and anybody wishing to have a great time in one of the few remaining pristine coastal areas in Europe. You might want to check out the local restaurants for fresh bluefin tuna at the end of June, it is caught the traditional way (same way the Romans did 2000 years ago) right in front of the house, and it is the highest grade tuna you can find, try the Sarda in Barbate's restaurant El Mirador, simply excellent. It was an absolute pleasure to have you as guests and we would love to see you back again in the future. Glad you enjoyed it! The perfect place for a relaxing summer holiday! Glad you enjoyed the villa and the area. Thank you for being such great guests too! We will be delighted to have you back anytime! From the commanding position at the top of the headland where there are breathtaking 360 deg views sits Villa Las Rocas. Walk directly from the villa into the surrounding countryside to birdwatch and appreciating nature , visit an ancient Roman city of ruins or trundle down to the long unspoilt beaches to enjoy the warm ocean. The villages close by offer a range of restaurants tempting you with local and international cuisine, quaint shops and traditional Spanish white villages. In May and June the fisherman in their trawlers can be seen harvesting their catch from the Almadraba in front of the villa and the fresh fish is quickly available locally. Whale watching, kite surfing, fishing and horse riding are popular attractions, besides flamenco, salsa and the sherry bodegas of Jerez. Or for a day out why not take a 35minute ferry across to Tangier in Morocco? Just over an hour away are Gibraltar or Jerez with airports and just a little further Sevilla and Malaga and then Granada.